Amphu Lapche pass combines with Mera peak superb trek takes us away from the more frequented trails leading from Everest, over a pass to the east. Entering Mera very sparsely inhabited Hunku Valley, we walk northwards through a beautiful high alpine environment, from Mera Peak (6476 meters) the highest trekking peak in Nepal towers over the valley. Traversing around to the north, we find a softer side, and from here the climb is equipment-free. It can be attempted if you have acclimatized well and have strong lungs. You will be rewarded by the view of four of the five highest mountains on earth standing proud over hundreds more peaks, many still unnamed. Starting from Lukla hike to Mera base camp, after the Mera summit, the trail will follow crossing Mingbo La or Tashi Lapcha down to the Everest classic route to Chhukung or Pangboche, via Tyangboche Monastery. Next day trekking to Namche and down to Lukla. From Lukla either flight or all the way trekking to Jiri or Sallari and drive to/from Kathmandu. Amphu Lapche Pass trekking require tented camping. It is possible basic tea house or guest house from Lukla to Khare camp and after the pass from Chhukum all the way to Lukla. Asian Hiking Team organizes Amphu Laugh trekking, tea house / guest house combined with camping or full board camping as clients request. It is also possible and better itinerary to climb Mera peak and Island peak includes Aphu Lapche pass trekking. Best Season: April - May / Sep. - Nov. Highlight of trekking: One of the adventure trekking in Nepal, the mountaineering, the culture , the experience require, view and adventure. Day 02: Full day Kathmandu valley Guided sightseeing tour. Day 03: Kathmandu to Lukla. trek to Chutenga, 3/4 hours, 3200 meters. Day 04: Chutanga to Chetera La, 5 hours (4580 meters). Day 05: Chhetera la to Khode, 5 hours (3614 meters). Day 06: Khode to Thangna, 5 hours (4300 meters). Day 07: Acclimatization day, Explore around the valley. Day 08: Thangna to Khare, 6 hours (5000 meters). Day 09: Khare to Mera Base Camp. 5 hours (5300 meters). Day 10: Base camp to High Camp, 3 hours (5750 meters). Day 11: High camp to Mera Peak summits (6461meters) to Base Camp, 9/12 hours. Day 12: Base Camp to Honku valley- Hunku Khola, 5 hours (4900 meters). Day 13: Hunku Khola to Hunku Pokhari (5350 meters) to Panch Pokhari 5 hours. Day 14: Acclimatization day – explore the valley. Day 15: Panch Pokhari to Amphu Laptsa Base camp, 6 hours (5600 meters). Day 16: Base Camp to Amphu laptsa pass (5845 meters) to Chhukkung (4730 meters), 9/12hours. Day 17: Chhukkung to Pangboche, 5 hours (3985 meters). Day 18: Pangboche to Tengboche, 5 hours (3867 meters). Day 19: Tengboche to Monjo, 7 hours (2850 meters). Day 20: Monjo to Lukla, 4 hours (2800 meters). Day 21: Lukla to Kathmandu by flight, free day in Kathmandu. Day 22: Spare day in Kathmandu (weather or any cause). Day 23: Transfer to airport for departure or next trip if any. Note: we organize as full board well Camping or combinate with hotel and camping as request. As well as without Mera peak climbing. Major Meals; Breakfast, Lunch and Dinner with hot drinks. Sagarmath and Makalu National Park permits, fees. All camping equipment, staffs, foods. Trekking insurance, equipment for all support crews and their daily wages. Trekking/ camping Equipment for support Crews and climbing. Trekking Equipment such as Sleeping Bag, Down Jacket and trekking Polls, sleeping matts (if needed as clients request). Free day in Kathmandu to make the final preparations for your trek or do some exploring on your own. Day 03: By Plane: Kathmandu to Lukla. Trek to Chudhenga 3 hours, 3200 meters. Breakfast time: 9 to 10 AM. Wake up call: 6 AM. Day 05: Chhetera la to Kothe, 5 hours (3614 meters). Day 06: Kothe to Thangna, 5 hours (4300 meters). Starting Time: as your own plan talk with guide. Hours: 6 - 7 hours. Overnight: Tea house / Tented Camping. Hours: 4 - 5 hours. Lunch Time: 12 to 2 PM. Day 11: High camp to Mera Peak summits (6461 meters) to Base Camp, 9/12 hours. Wake up call: 2 AM. Altitude: Mera 6461m and base camp 5300m. Hours: 7 - 13 hours. Hours: 5 - 7 hours. Starting Time: Rest day as you want as talk with guide. Day 16: Base Camp to Amphu laptsa pass (5845 meters) to Chhukkung (4730 meters), 9/12 hours. Day 21: By Plane: Lukla to Kathmandu free day in Kathmandu. Early Morning flight to Kathmandu, free day, shopping, relax. Day 22: Free day in Kathmandu for shopping and other activities. 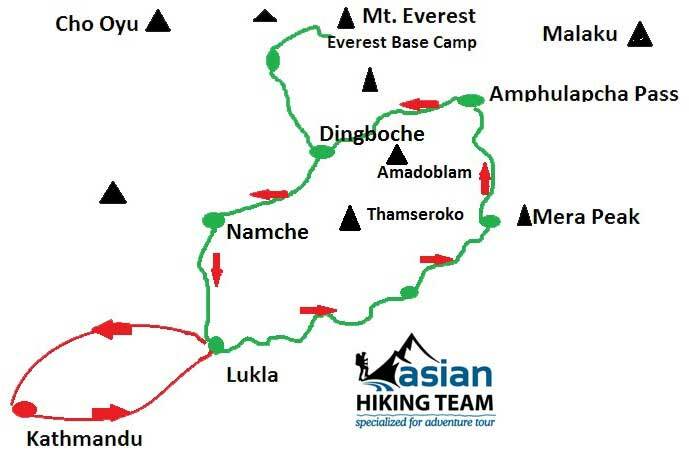 Note: On this trek require climbing and camping equipment so please contact to Asian Hiking Team for more information.